The Touchscreen should continue to work - it will only need a new calibration if you use Factory Reset or when you update Firmware (e.g. 7.9.4 -> 7.9.5). Here starts a steep learning process on the FLX capabilities - good luck! I have had mine since 2015 and I learn something new every week! In your case you use your FLX with what as material and in what type of show ...? You re in the same configuration then me. 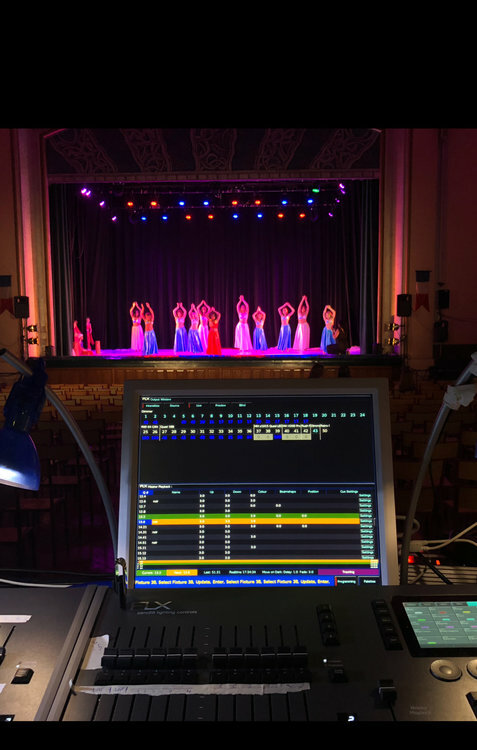 I've just got two moving head LED units which I used on the show just completed - first time with moving lights (ok I had one MAC250 for years, but rarely used with my Fat Frog). FLX made this very easy with position palettes, move on dark just works and I even got a circle effect going very quickly (Jon will be relieved to hear that with all of our historical moaning about the effects engine!). You will need to take a few more fixtures home to practice with! Try very hard to move away from the fader mentality. If your experience is with a much simpler/older desk, learn how to set up groups and palettes and how to dimension effects. With these your movers will become quick and easy to use. Without you will fight the complexity of all of the control handles and get very stressed during show plot. Reading back through this thread to some of the earlier posts, Edward (maybe Jon) suggests using different playbacks to set up a cue stack for each of your dance sequences. Then you can play back these whole stacks in any order - actually with FLX you could overlay them if you wanted. Another way would be to create "partial looks" on a larger number of playbacks and then overlay these to create different looks for each dance. This is fairly advanced and will take some practice, but would give you a very large range of elements you can mix on the fly if you need to busk. It might be worth getting some experience in your own time (at your own pace), then getting some more detailed help from your local distributor (ok, I guess you bought your FLX from Thomann though, so you might have to ask nicely...) and getting some support on creating more complex looks once you've grasped the fundamentals. Today I have been to the theater where I have my equipment installed for a Saturday show. But over the hours things are better and I can do things. One of the other things that are missing is to be able to 24/48 on the same channel to put several DMX addresses. As for example for dimmers, or we can put several circuits on a same fader. I solved the problem with a playback. One of the other things that are missing is to be able to 24/48 on the same channel to put several DMX addresses. As for example﻿﻿﻿﻿﻿ for dimmers, or we can put several circuits on a same fader. I solved the problem with a playback. Every channel fader can have a single fixture patched to it, but it can have multiple DMX addresses. To add these tap SETUP, select your fixture, and tap Address. Then type in the extra DMX address for the fixture, and tap Add as additional address. This will give the single fixture multiple DMX addresses. The reason you faded through white into your UV playback, is due to the colour fade time. Fixtures default to white so that when you turn them on, you can see them lit. Therefore you need to adjust the colour fade time of your UV playback. To do this hold VIEW and tap your UV Playbacks button, and tap the colour fade cell and set it to 0 seconds- the default is 3 seconds. Now when you raise the fader again the fixture will be raised into UV from off. You change the fade defaults on the console, in SETUP -> Defaults -> Colour fade. Hope that helps, any queries as always let us know. Still a concern on the fader (chanels) I have no problem on color palettes outside always the famous UV on the encoder wheels. I have a moment ago with the wheel to mount the UV to the max. What to do that the UV do not return (in mode channels)? If you push your UV playback up, change to channels fader function, the UV playback will still be playing, as you haven’t released it. The shortcut to manually release all playbacks, is to hold CLEAR, and tap the FADER FUNCT. button. This will return your UV parameter to its defaults (0%). Hope that makes sense and is what you’re after. Any queries let me know. I also understood the patch operation of several DMX addresses on the same fixture. Convenient to avoid having too many take chants when there are many numbers of circuits. (Example next week I go to a Theater or in traditional, there are 350 DMX circuits. About Capture (For Mac) installation is complicated? Thank you for your help and I'm happy with my purchase! Returns in the coming days to talk a little about the things I feel over the days and help the best. But it is obvious that this product must be able to interest a certain number of structures. So video in French, that I can do to boost things and help you sell this product in France! Did you get these "issues" sorted out? (1) Looks like something that should be handled by tracking - FLX defaults to "Tracking (Basic)" which means it's a tracking console but SmartTag is enabled to handle most of the complexity of tagging so you can just program away without worrying about the correct information being recorded in the cue. Tracking means that if "something is happening", that "something" will continue to happen until you hit a cue that has an instruction to "do something else". So you shouldn't have to replicate cue 4 to cue 5 to cue 6 etc to get the effect to continue. I understand from another thread on an intensity chase that tracking doesn't necessarily operate across chase steps, but I don't believe this is your situation here - you have a cue sequence not a chase. (2) Looks like it should be handled by move on dark (this just "works" - as long as you have the fixture intensity=0% between the two cues - although one thing that caught me out is I recorded a blackout cue as a blocking cue (SHIFT+RECORD) and that stopped the MOD happening in preparation for the cue after the blackout - this makes sense as the cue would be carrying position/beamshape information for the fixture I wanted to MOD, so it was my mistake not the consoles). You also mention Capture visualisation software. I'm also toying with the idea of purchasing this software, however it is 350GBP so quite an investment for me personally. I'm thinking on this one, so any comments on using this with FLX would be interesting - Jon/Ed is Capture the visualisation software you used in the Christmas Advent videos? Which version/name? For testing, we use Capture Nexum. overall things are going well! so either I put aside or parfoid I find the solutions quickly! then saw that I start on the console can be there. What things are going on? indeed when we go on the search for color the picker and we want the amber the software will make the color with the white red green blue .... and since the access to amber is done by the buttons rotational that must be rotated long to have real amber the time is lost quickly if the amber returns often! so I think in future evolution the management of all colors on the picker would be a big plus! but overall happy with the new rule! in daily use what can be problems that will do bug ? is there thing that musn’t do during encodage or performance ? I use lyre and using moving effect... working correcty. thank for a help ! To stop the mover effect you will need to choose Effect->No effect. You could do this when you record your blackout or go back and use Update. You can use shift+record to put in a blocking cue if needed. That’s quite an achievement if you’ve already run a show with moving lights less than a week having a brand new console! If I undestand when i finish a cue when info to record I can go to name and giving number and validite thé cue ? Edward will probably give better advice but I guess (as you suggest earlier) that intensity@0 means SmartTag does not record to effect off. For that cue when you go to record, on your external monitor you should get the record options page - turn off SmartTag for that record so fixtures with changed but intensity@0 will get recorded. Great photo. I see you get ch1-24 across one monitor line. That is nice, mine are spread across 2. So performance is finish ! at 99,95% Good night ! tell me what this can happening ? Bug from software ?